FITZGERALD, Ga. — Adrenaline continues to enhance its Blast™ and Surge™ toy haulers to make them even more appealing to outdoor enthusiasts. The latest change is the addition of a Platinum Package. This new package gives the Blast and Surge haulers an aggressive new look with platinum ribbed aluminum sidewalls, black awning and black trim pieces. Adrenaline introduced the Platinum Package on a Surge toy hauler at its Dealer Seminar this past summer. "The reviews from the dealers were so positive that we decided to extend the Platinum Package to both the Blast and Surge product lines," said Lawton Tinley, president of the Adrenaline division. "The silver skin with the black trim makes the trailers look substantially different than other products on the market. This will appeal to the enthusiast who wants to stand out from the rest of the crowd." The Blast is a multi-purpose hauler. Owners can load it with tools and supplies for the workweek and then roll on the toys for the weekend. Most SUVs, half-ton pickups and even smaller vehicles can easily tow the Blast hauler. This toy hauler has base weights starting at 3,400 pounds, and its box length starts at 15 feet. Another addition for the Platinum Package is the use of foam core insulation in the sidewalls, as well as an upgraded A&E awning in black. "The foam core provides another layer of insulation and noise abatement, and the color coordinated awning helps to complete the whole package," said Tinley. The Blast toy hauler is well equipped with a complete galley, a marine toilet and a shower. There are three floorplans to choose from with the MSRP for the Blast Platinum Package starting at $13,203. Surge full-size toy haulers are available in five different floorplans with exterior lengths ranging from 24 feet to 33 feet. Each Surge hauler is equipped with a spring assist ramp door, making it easy to access those motorcycles and ATVs. The MSRP for the Surge Platinum Package begins at $26,330. What makes the Surge toy hauler so great for weekend adventurers is that while it's functional for just the guys, it also has the amenities necessary to bring the whole family along. Adding the Platinum Package to the Surge hauler's sleek lines give this trailer a definite bad boy appearance. Yet, its ducted air conditioning, patio awning, well-equipped galley and optional stainless steel portable gas grill add comfort and convenience. 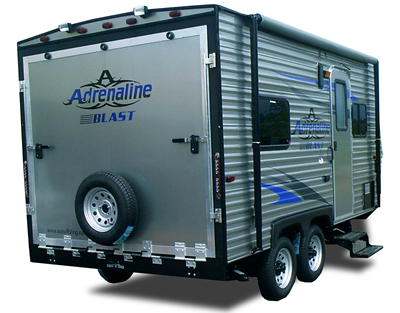 Adrenaline developed its line of Blast and Surge toy haulers to appeal to those who enjoy the outdoors with vehicles like ATVs, sand rails, motorcycles and snowmobiles. The Platinum Package is just one more way for these enthusiasts to say, "I stand out from the guy next to me."